In his continued quest to remain a relevant heavyweight in the MMA landscape, former UFC champion Tim Sylvia will be fighting another veteran of the Octagon in Paul Buentello on August 14th. The two giants will headline Powerhouse World Promotion’s “War on the Mainland” pay-per-view broadcast and will be vying for the vacant PWP heavyweight championship. 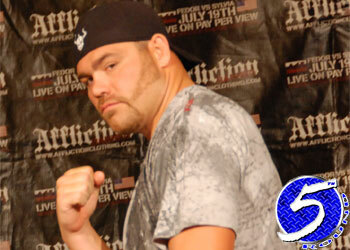 Jens Pulver will also make his return to mixed martial arts when he meets Diego Garijo in a lightweight affair. “We’re not interested in signing fighters to long-term contracts. We’re interested in the fighters being self-sufficient and stable,” PWP CEO Brian Manna said. The card features a handful of other former Octagon competitors as well, with Jason Lambert, Thales Leites and Terry Martin scheduled to compete. The event will be held inside the Bren Events Center in Irvine, California on the campus of UC Irvine. Tickets are available on Ticketmaster.com and at the Bren Events Center box office. Seats range in price from $35 to $295.